Porcelain veneers can be a transforming experience for your smile. It is one of the most popular cosmetic and aesthetic treatments in the field. Your treatment will begin after an examination has been performed to assess your oral health and dental structure. 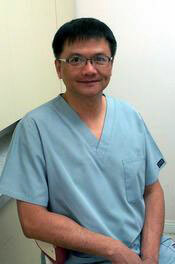 Dr. Chiang’s specialties include porcelain veneers in Upland. During the first visit, your teeth will be buffed and 1-2 mm of enamel will be removed to prepare for the new veneers. This will allow the veneers to be placed flat and in line with your surrounding teeth. An impression will be created and sent to the lab. Temporary restorations will be worn while the permanent veneers are being fabricated. Before the veneers are placed, a local anesthetic will be administered to ensure your comfort. The temporary veneers will be removed and permanent ones will be checked for fit. If you believe adjustments are required, please notify the dentist. Veneers cannot be altered once they have been secured in place. The veneers will be bonded after a mild acidic solution has been used to clean the surface of your teeth. They will also be checked to ensure adequate space is available for flossing. Veneers can change your smile in as few as two visits. If you’re considering this popular cosmetic treatment, please call our office and schedule a consultation.